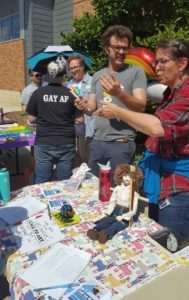 On Wednesday, Aug 29, hundreds of students at Dakota State University gathered together to celebrate and promote various clubs and activities on campus at the annual Activities Fair. 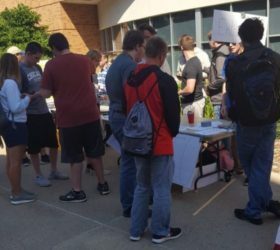 In the area between East Hall and the Trojan Center, around thirty clubs set up tables to promote their activities to students and encourage them to sign up as members. The goal of the Activities Fair is to get students familiar with the dozens of clubs and organizations that they can be a part of on campus. This included student-run groups like the ever-popular Gaming and E-Sports clubs, as well as organizations that are run or influenced by the staff at DSU, like DSU Live and Hall Council. Among them were a few new faces, like the Call to Art club and the Spikeball club, who seemed to be gaining plenty of interest from students. There were many, many sign-up sheets and event flyers being handed around, so rest assured that campus-wide interest in these clubs will not be going away any time soon. Most of the clubs, like the E-Sports Club and DSU Live, had meetings or events not soon after the fair, to keep the level of student engagement high. DSU’s Activities Fair only happens once a year, near the beginning of the fall semester here on campus. If you missed it, it is not too late to sign up. Find members of the clubs you are interested in and ask about joining; it is a fantastic way to get involved on campus.